High energy fun filled group session of water activities and beach games 7-15 year olds. 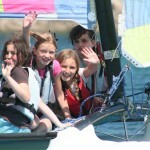 Safe social fun activities, sessions may include kayaking, sailing and Stand-Up paddle boarding (SUP). An action packed 2 hours to provide your children with a great activity and give the parents a couple of hours break! These sessions are the perfect way for visiting children to mix and make new friends while taking part and having a go at water and beach based activities. Lead by our qualified instructors, while there is no formal tuition, the group will develop new skills while having fun in a safely lead activity. These sessions are scheduled to run on the following days during peak season, though there are some weeks that these may vary.